Fledgling; Fledge is the stage in a young bird's life when the feathers and wing muscles are sufficiently developed for flight. It also describes the act of a chick's parents raising it to a fully grown state. 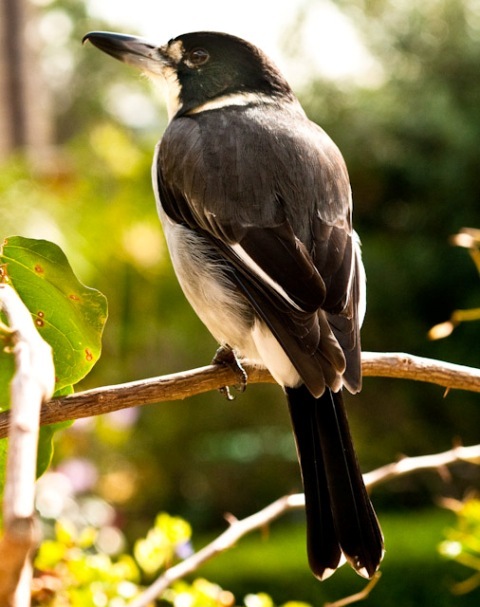 A young bird that has recently fledged but is still dependent upon parental care and feeding is called a fledgling. In ornithology, the meaning of fledging varies, depending on species. Birds are sometimes considered fledged once they leave the nest, even if they still cannot fly. Some definitions of fledge take it to mean the independence of the chick from the adults. During this week the full cycle of one year in the bird world has been witnessed. 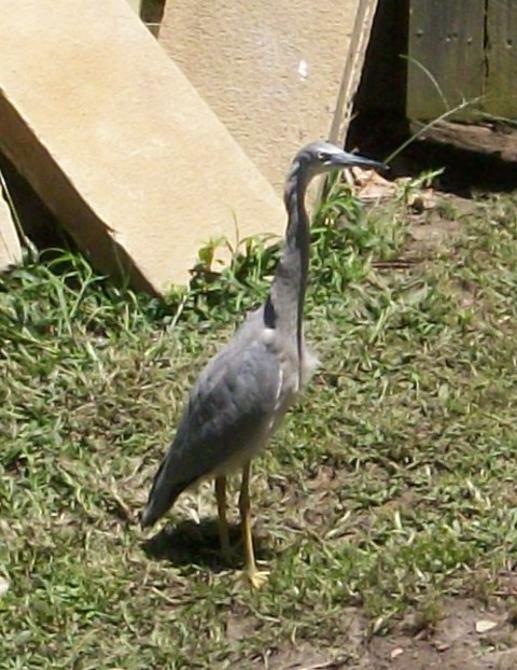 The Australian Blue Crane, (also called the White Faced Heron; Egretta novaehollandiae) who was seen in Careel Bay creek for the past two years, and lived there during much of our Winter, and then was seen with a mate, showing this favourite fishing ground in Spring, then spotted in Careel Bay with six other birds in late Spring, some of them quite obviously very young, has now brought two children to the tidal rush in Careel Creek. Again for the fishing. The one shown here was on the opposite bank from the path’s wend and more interested in spotting the fish then having its photograph taken. On Wednesday it and one of its siblings were making their way down the creek as the waters emptied after high tide. They flew up into a eucalypt on approach. On Thursday it gave a ‘you again’ look and went on with its fishing. Also seen this week are fledglings of the Galah (also known as the rose breasted cockatoo; Eolophus roseicapilla), Magpie (Gymnorhina tibicen), Pied Currawong (Strepera graculina) and Laughing Kookaburra (Dacelo novaeguineae) worlds, all shedding their ‘baby feathers’. Some are still with mum and dad, squawking quite loudly for food if part of the parrot world, others follow them across the green fields of Pittwater or through our banks of trees, learning how to feed themselves, if juvenile magpies, currawongs or kookaburras. 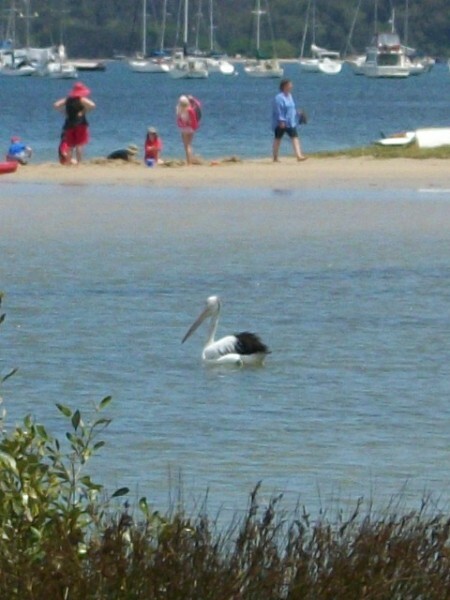 The Cranes in Careel Creek and a lone young or first year Australian Pelican on Careel Bay itself, also fishing at high tide, seem to be the sole juvenile avian out on their own. Juvenile birds can be spotted by the colours of their feathers, usually a little more speckled, with brown tinges or appear more dirty then the pure white they may become if an Ibis, or more mottled over the back as seen in young Magpies. They may also have the smaller downy feathers that protected them in the nest poking out from their plumage. Their facial markings will also not be as distinct as those of adult birds. Also seen; Willy Wagtails (Rhipidura leucophrys) stalking, stirring up and rising to air in quick flits while feeding on insects in the recently mowed parts of the ovals at Careel Bay. A single Spotted Turtle-Dove (Streptopelia chinensis) was also seen idling in the morning sun on Friday. This Pied Butcherbird, (Cracticus nigrogularis), photo to left was taken by Michael Mannington earlier in the week too. All have a sleek well-fed look due to the abundance of local food available in Mid-Summer. Insects of every kind, dragonflies, butterflies, moths, wasps and plain old black flies are everywhere. Many of the local flowering plants have shed their petals and producing nuts and fruits. Photos by Michael Mannington and A J Guesdon, 2012. All Rights Reserved.